When does a hobby become a series artistic endeavor? For Grand Strand photographer Brant Barrett, crossing the boundary involved discovering the difference between taking pretty pictures and creating art. Barrett searched for that transition point, found it, and continues to learn and hone his craft as he produces award-winning work, some of which is currently featured in the Feast Local exhibit at the Franklin G. Burroughs – Simeon B. Chapin Art Museum in Myrtle Beach. Content in Barrett’s photography ranges from tobacco fields to bus rides to restaurant kitchens to a wildlife refuge, yet his body of work displays a motif of Southern culture and an earnest reflection on people and places that might otherwise be overlooked. Barrett entered the world of photography in his retirement, seeking a pastime and a creative outlet. Armed with a digital camera and a state park pass, he took “a gazillion” pictures of birds, landscape and wildlife at Huntington Beach State Park over a period of a few months, and while the result was rewarding, he felt an urge to do more. 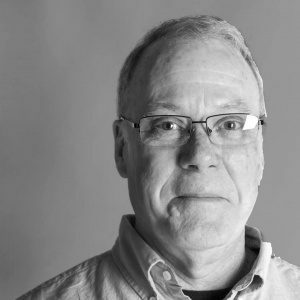 Barrett enrolled in his first photography class at Coastal Carolina University in 2012 and over the past five years has studied under multiple professors. However, they conveyed essentially the same response to his work. Over the next few semesters, Barrett began putting more research into his work to gain a full understanding of the story behind the images he sought to capture. One project, titled Bright Leaf, was created from Barrett’s visits to local tobacco fields over a period of two years. Barrett began his research by reading Eldred E. “Wink” Prince’s Long Green: The Rise and Fall of Tobacco in South Carolina and by considering numerous approaches to the topic. He finally settled on photographs that document the modernized process of tobacco farming, in contrast to the more traditional method. The reasoning for his focus grew out of an understanding of how farming practices represent Southern lifestyles, both traditional and modern. Barrett’s photograph Rooster Time from the Bright Leaf series won the photography category at 2017 ArtFields, a prestigious juried annual art festival in Lake City, South Carolina. 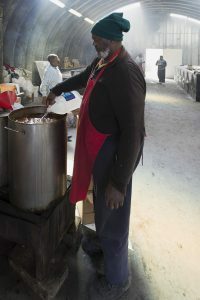 Barrett’s current exhibit at the Myrtle Beach Art Museum began when Liz Miller, curator at the museum, asked him to document people and places involved in food preparation and service in Horry and Georgetown counties. Barrett visited numerous fairly humble establishments that serve a local crowd and would likely be missed by a tourist passing through. 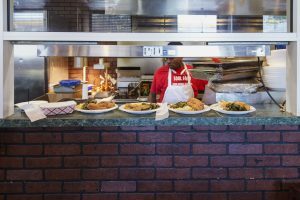 Scott’s Bar-B-Que in Hemingway, Ocean Fish Market in Conway and Big Mike’s Soul Food in Myrtle Beach were all destinations where Barrett photographed the cooks, the diners, the decor and the process of preparing food in a home-style environment. Miller initially sought out Barrett for the exhibit because she was familiar with his background and his work. “He knows the people, he knows the places, he knows how to capture the feeling of the place. When you experience his photographs, you know what it feels like to be sitting at that diner,” Miller said. In considering Barrett’s artistic progress over the past several years, Selby said it’s rewarding when students take critique to hear and fully incorporate it into their work.